NOTE: Jordan Clark and I will be giving an Artists Talk Sat. night Feb. 24th, 2018 from 7 to 8 PM — with folks gathering at 6:30 — over at The Gallery at Cerulean, 1439 NW Marshall St., Portland OR, PH: 503 308-9137. I have a bevy of paintings @ ‘The Gallery at Cerulean including my newest, “The Music Genie” you see below. I welcome those that can come hear us and see our work. The show is up through Feb. 26th. 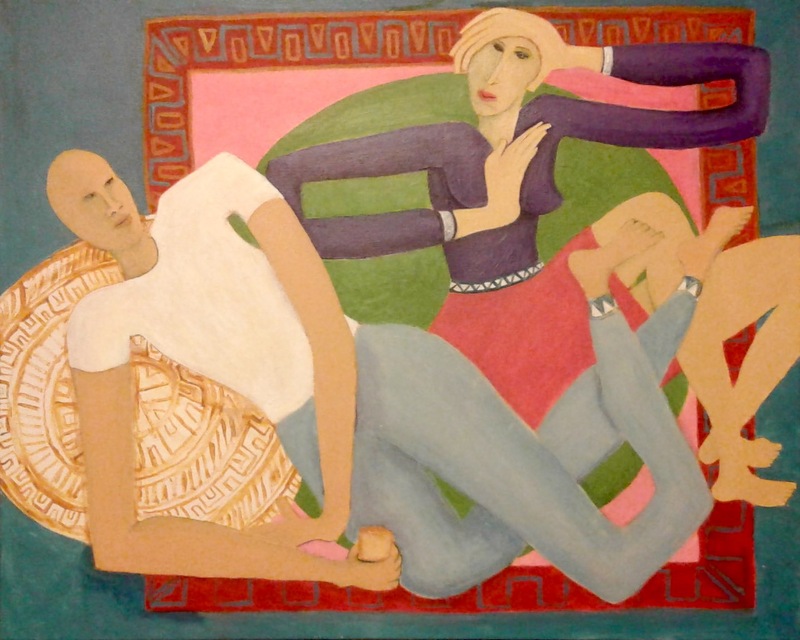 It is well presented with both my work and that of Jordan Clark harmonizing with each other by means of color and shapes–though his work is frankly boldly abstract and mine figurative. The Cerulean is both a wine bar and art gallery on the edge of the Pearl district in Portland. The Music Genie was inspired by my husband who was in one of his reverie’s composing music. 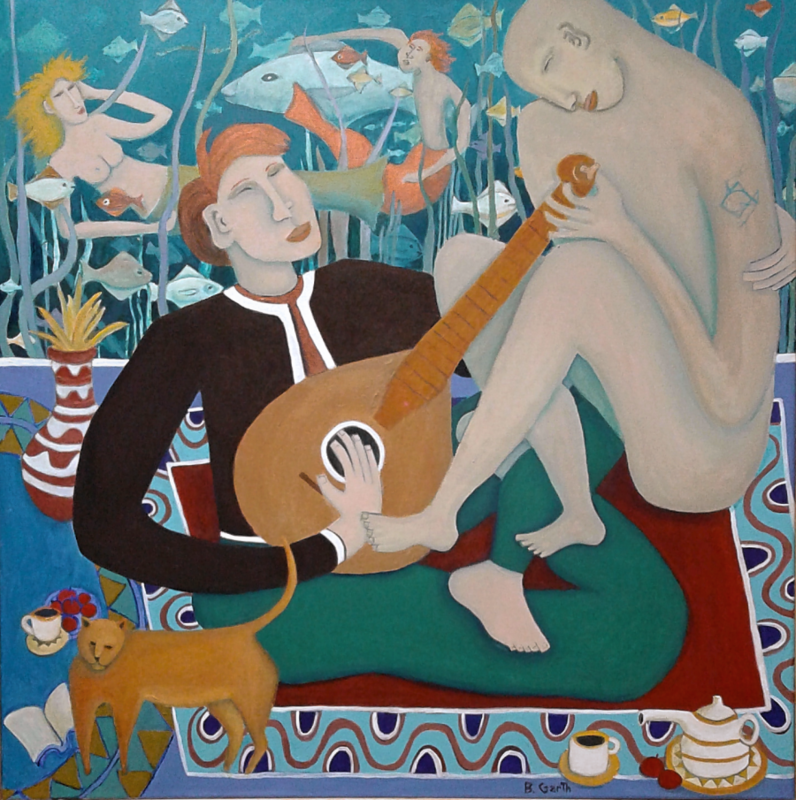 The watery depths in the background and the ghost like Genie to his right show him exploring his musical imagination of harmony and inter connected feeling. I finished this painting just in the nick of time with putting in final touches just moments before putting the painting in with the rest before my husband drove off with them to take them to the gallery the day before the exhibit. Fortunately acrylic dries quickly with the aid of using a hair dryer! I had pulled an all nighter and had to crawl into bed–satisfied but curious as to how it might be received. My paintings are a lot like dreams where everything gets mixed together–thus the surrealist edge. For me what I am after is an exploration of the unconscious that helps me realize what it is I am feeling and thinking of underneath. In this case it was and is the joy of experiencing summer after a difficult winter earlier this year. It got me to remember joyful times in the past such as swimming in Mexico when I was seventeen. I remember swimming in the warm waters off of Guaymas and being thrilled by all the fish! And yes I loved being on my own with my sister and enjoying the Latin culture. I think my trip to Mexico as a teen reminded me of my early childhood when the boy I played with next door had parents who were from Spain. I was in love with their music and dancing and very different approach to life to that of my family. I was sorry when we had to move away. 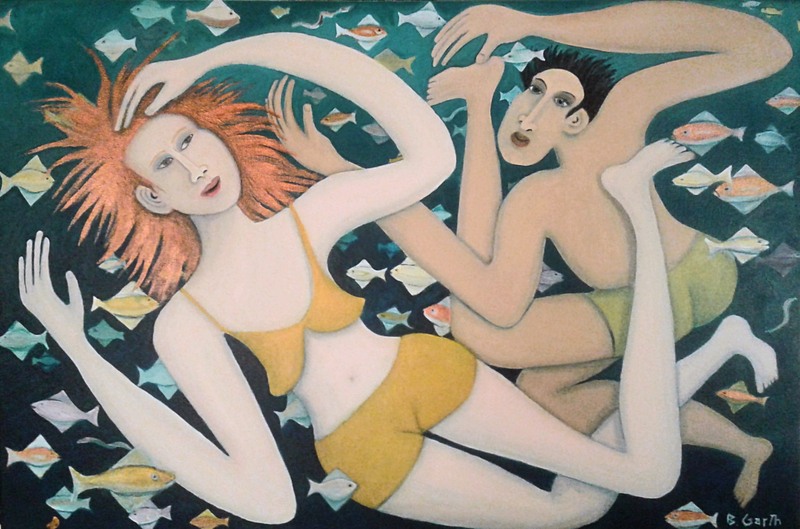 This painting mixes experiences since quite obviously I am not a red head, nor did I even have a boyfriend at age seventeen except perhaps in my imagination. I am thinking of visiting Mexico again sometime soon when I get the chance. I bet it will help foster a whole new series of paintings celebrating life! This is my new canvas painting I am working on. It is inspired by an extremely small painting on watercolor paper I did back in San Jose (about the size of a large card). Obviously I am still working on the cat!! This time it won’t be brown. It will be a contrasting color… And yes I want the cat to feel alive with movement! I often like to make an underpainting like this before I go ahead and paint the whole thing in color with all the shading, contrast etc. This way I make sure I get the composition worked out in a simpler state rather than have to remake the whole thing if I didn’t get it right. 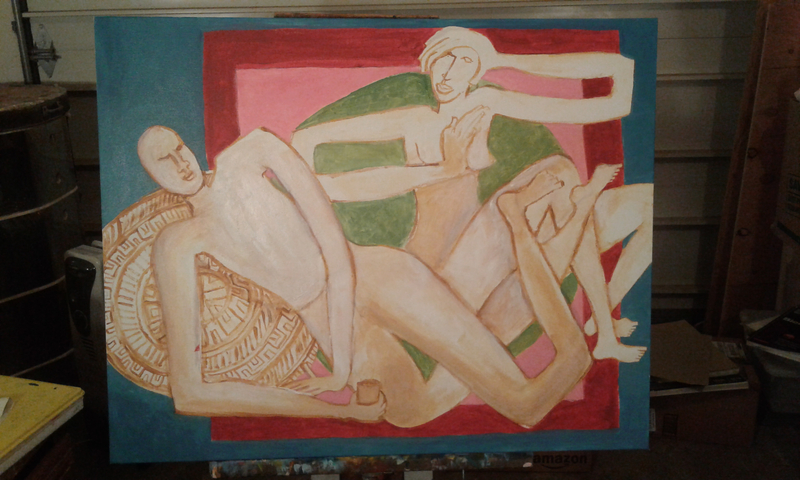 Another update on my painting, “Legs Like Vines.” A bad headache the other day (from an egg I hadn’t boiled quite enough–I have histamine sensitivity) slowed me down. But late tonight I was back at it again. There is more to do with it of course. But am sharing my process. I am not one of those really quick painters. Am a perfectionist more or less in this area of my life. Plus all those intricate patterns take time to get right! I use the principle of spontaneity and structure working together to create tensions and harmonies. On yet another level, this painting is starting to make even more sense to me considering the fact I discovered very recently that I need to take a lot more silica than I thought I’d ever need in order to be OK. My legs etc. have truly in their way been like vines. I laugh since what else can one do. There are both positives and negatives to being what is considered to be too flexible. The big problem for some of us is that we have a hard time making enough collagen. This eventually starts to become a real negative, especially as one gets older. And yes, more silica is needed to make the collagen. With everything improving, who knows where I will be at in a year. Though one thing is for sure, more than likely I’ll be painting up a storm!! For more info on this condition, I suggest you look up Ehrlos Danlos Syndrome. If you think you might have it, please consider joining some of the EDS support groups on Facebook. The Cusack Family Protocol is the best! Its been a rainy Thanksgiving so far. Plenty of chance for me to work on my painting! Though today I was able to go out for a walk before it started raining again. I wore my poncho just in case! This painting is changing before my eyes. I am really uncertain what I will call it. How the pillow or rock/Mayan Calendar (!!) turns out will affect it quite a bit, of that I am certain. I still have to work on the male figure quite a bit, it needs the definition shadows bring. I also need to finish the edging around the carpet. And yes I do like the carpet. The rectangles and triangles are subtle but effective. They echo the Calendar symbology nicely. This piece is kind of blowing my mind, such as it is. Not at all what I expected! 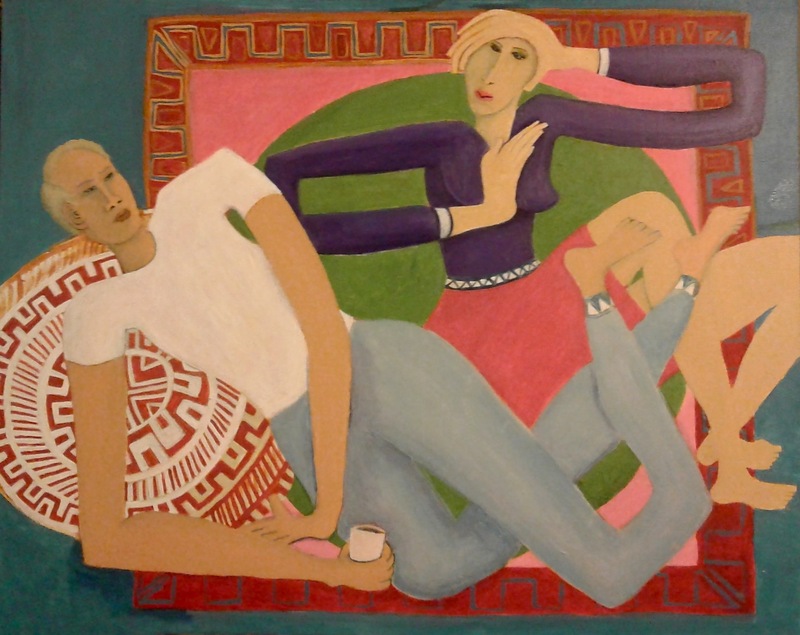 But that is the fun of painting for me–I let my unconscious come through and have free reign. I just got started putting the color in. Thought I’d do something a little different, more like what I sometimes did working on clay. Let design have it’s say more and keep it playful. As you can see, I am not done! 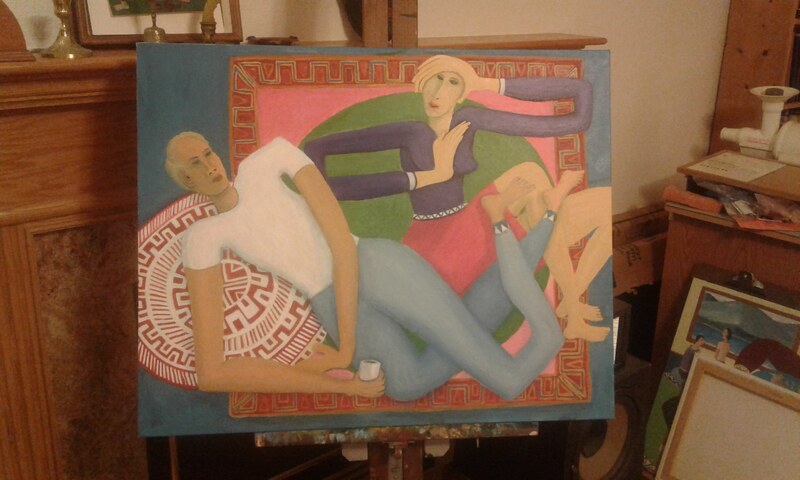 I have not worked on the bodies or pillow (except for the sketched in underpainting) or even finished the background. I like the bold design and colors so far however. I may or may not put any actual leaves into the painting. I’ll be playing around with that concept in my head whether or not I try it.